[PDF] Navy's Most Wanted: The Top 10 Book of Admirable Admirals, Sleek Submarines, and Other Naval Oddities (Most Wanted Series) | Free eBooks Download - EBOOKEE! Description: From historys earliest days men have gone down to seaon logs, then boats, and, subsequently, ships. Norman Polmar and Christopher Cavas maneuver in Most Wanted style to find the best and worst of the admirals, ships, inventions, submarines, torpedoes, and aircraft that have fought on, over, and under the waves. The top-ten lists in Navys Most Wanted rank the worlds biggest battleships, the fastest aircraft, and most powerful submarines. Pop cultures take on naval affairs is shown in chapters on the best and worst Navy movies, the Navy in song and fiction, and movie stars and politicians who served. 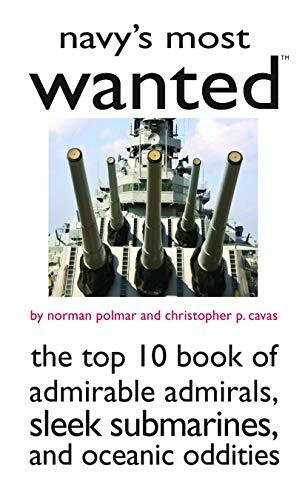 No comments for "[PDF] Navy's Most Wanted: The Top 10 Book of Admirable Admirals, Sleek Submarines, and Other Naval Oddities (Most Wanted Series)".